The Nintendo Switch exclusive Travis Strikes Again: No More Heroes was recently given a launch date by Grasshopper Manufacture. Instead of its original 2018 arrival, the game will now release on 18th January next year. So, as you know, Super Smash Bros. is coming out in December...I'd feel really bad about impacting their sales negatively. I'll give them a break and move it over into next year. 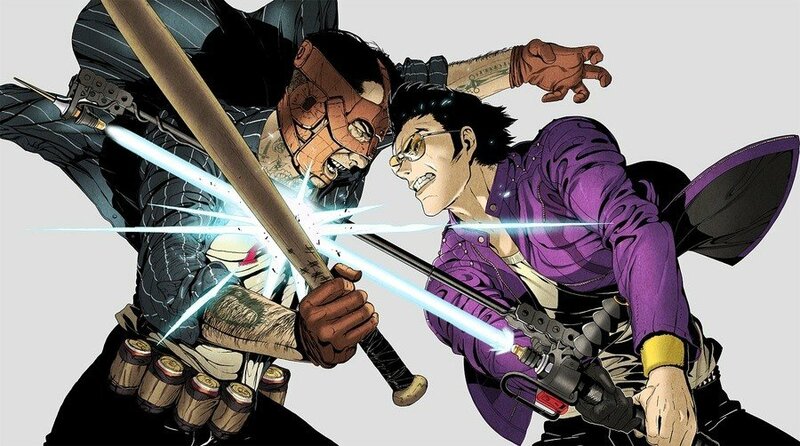 On a separate point, Suda51 said how Travis Strikes Again was "about 50 percent" hack-and-slash, and the other half was comprised of a racing game, puzzle action game and side-scrolling game, as Travis and Badman are stuck inside the Death Drive Mark II - a phantom games console from the '90s. You're actually always inside the game but you're able to choose the cartridge or game you want to play from inside it...There's actually only six games in the Death Drive machine, which is part of the story. But the final stage is the seventh stage but that's kind of a secret. The only motion control feature is that when you're charging up your beam saber, you have to shake the controller. There are certain special moves at the very end, you'll shake it again -- that's about it though. 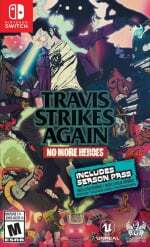 Are you excited about Travis Strikes Again: No More Heroes? Do you think Suda51 made the right decision not to release the game alongside Super Smash? Should more games avoid lining up with anticipated releases? Tell us what you think below. One of the downsides of some major releases is that they do often stifle lesser known or "smaller" titles. So this is probably for the best. But honestly, I fully expect Smash will sit right there with BotW, Odyssey, and Mario Kart as an evergreen title on Switch for years. Probably a good idea, I imagine most of us (including myself) will be in a Smash Bros coma for much of December. I literally lol when I saw this on Twitter yesterday. He's a funny man! Yep Smash would certainly struggle up against Travis. Really though, Nintendo should have moved Smash to next year to avoid clashing with this sure fire sales monster. @ReaderRagfish 95 more days!! Once I finish up Prime 2/3 and Other M, it’s back to training with my main, Samus. @Heavyarms55 Splatoon as well. That game is still constantly in the Japanese top ten. Splatoon is huge in Japan, but it's quite small other places and remains far away from the 10million sellers that are Zelda, Mario and MK8. I’ll be playing Smash nonstop for months so probably smart. @faint Agreed. Silly me for forgetting that. @rushiosan What a cheap sense of humor. Seeing as how I’ll be playing almost nothing but Smash Bros until Christmas when I remember other games exist, this is probably smart. Same difference - My $60 are on Kingdom Hearts 3 in January. @iLikeUrAttitude I hope they’re making one. The Wii games are immaculate. @Tibob Considering it's at what, 7 million(?) last I heard, I think it could easily break 10 million by the end of the systems lifespan, especially if further support is announced. @iLikeUrAttitude You know, putting a one liner really doesn't defeat my entire argument. Probably the best time to release it. It’s not a big name so avoid the big hitters. Ugh. The Travis Strikes Again demo at PAX kinda soured my expectations for the game. It felt about as shallow as Pokemon Rumble. I'm not sure I want to buy the game even considering the delay. Smart move. Plus that means an even larger install base to work with. Ah Suda lol. I got enough to play this year anyway. If only Travis were put in SSB... Suda's such a Nintendo fan. @Tibob You're kidding right?? Splatoon 2 is close to if not over 7 million worldwide right now. Even if half of that is Japan that's still a nice chunk for the rest of us. Can totally see that passing 10 million some day. @link3710 Lol, didn't see your comment till after I posted mine. @iLikeUrAttitude That's what I keep saying. This games gameplay does nothing for me. Game looks bland and I'm willing to bet it will cost $40 or more too. I may get it for less then $10 or if it gets amazing reviews but I doubt it will. @Spoony_Tech This would look more promising if we got to see the gameplay of other worlds. But even then I would still be hesitant because the worst world is the first one. It would be a bother forcing myself to playthrough to find some decent gameplay. I desperately need to see the gameplay of the other worlds before I grab this game anyway. I don't mind a little mindless hack and slash, but not for the whole game. No offense meant to what is an already niche game series but the only way this game isn't going to bomb is if it is the only game of note to release in January because everything I have seen of it has looked really really boring, and that seems to be the general view from what I have seen. Splatoon almost sold 7mil. It's a lot but seven ain't ten. It might get there someday but I wouldn't bet on that. It sold twice less than the big three in both US and EU. I think it is a good thing Suda does this. It isn't often one of the giants care about lesser known titles like this 'Smash' game. Now, I don't think this will impact the sales of the tennis game that much, but Suda even mention them should give them a boost. So they decided to launch around the same time as Kingdom Hearts and Resident Evil? Bold move. @Callmegil first of all, a Switch game competes with the Switch Line-Up. Second of all, the Smash Ultimate comment was a joke. @geheimxy That's not entirely true. Maybe for someone who only has one console, but I can give you examples of console lineups being affected because they were released in the same month of an exclusive lineup on a completely different console (Look at the comment above yours). Regardless of being a joke, does not defeat the purpose of my argument. @LegendofCreed hardly competing... those are PS4 and XB1 titles and not for Switch. But for consumers with multiple systems, I understand what you’re trying to say. @iLikeUrAttitude Its a bit offtopic but amazing avatar dood! On Topic: I feel like the Smash hype would keep going even later than December. The hype for Smash4 lasted a really long time and I think the same went for Brawl. @Ardisan Thank you, I like yours as well. With how good Smash Ultimate looks, I wouldn't be surprised if the hype lasted until the end of the Switch's life cycle. I think its great.. this game was one of the main reasons i bought my switch almost a year ago. I hope it was worth the wait..
@Cobalt Still looks like the same level, just slightly different. I'm hoping they release gameplay of the other "worlds" to see if they're worthwhile. @ekwcll Not really into Fighting games. And will always play a new game over replaying an old one for $60. I'll get R2 on PC when it hits a Steam Sale someday. Super intelligent IMO! I'm not a fan of the series and wasn't going to get it anyways......but now, at least I'll give it a thought. If it were to release when Smash comes out I wouldn't have even blinked at it. @Tibob seven million isn’t that far from breath of the wild. @faint Seven is not FAR from ten, yes. "So, as you know, Super Smash Bros. is coming out in December...I'd feel really bad about impacting their sales negatively. I'll give them a break and move it over into next year"
Lol, he's just trolling! Its okay though.